These printed ground meat nd wild game freezer bags are convenient for home butchers and deer hunters who process their own deer. Easily mark your ground venison for the freezer. Quality, 2 mil, Polyethylene bags have a 1-1 1/2 inch bottom gusset for extra capacity and standing convenience. Pack of 100 1lb. ground meat bags. 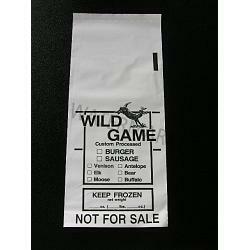 Ground Meat Game Bags-1 lb., 25 ct. Vacuum Sealer Bags Quart Size 8"x 12"
Vacuum Bags Gallon Size 11" x 16"